Honda returned to the 500 cc class of the World Motorcycle Grand Prix series in 1979, following a twelve-year hiatus. The machine they had developed for their comeback - an entry in the World Grand Prix's most prominent class - was the NR500, powered by a four-stroke, DOHC V-four engine. With its oval piston engine incorporating eight valves and two connecting rods per cylinder, plus an aluminum semi-monococque frame complete with an inverted front fork, the machine surprised everyone with its daringly innovative technologies. "When I look back at it, I'm not sure if we were experimenting with cutting-edge technologies or obsessed with foolish ideas, " recalled Toshimitsu Yoshimura, an engineer involved in the development of the NR500's oval piston engine. During its first years in motorcycle racing - dating back to a memorable entry in the Isle of Man TT Race - Honda won event after event with four-cycle engines. They achieved so much success, in fact, that four-cycle engines came to be thought of as a Honda specialty. 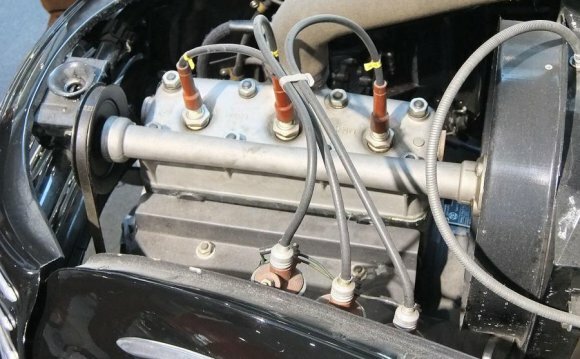 Though two-stroke engines had the benefit of relatively higher output, nobody could stop Honda from wanting to develop four-stroke engines capable of producing even greater power. In that regard, the conventional thinking proved somewhat contrary at Honda. In fact, competing in the TT race was in every perspective an extraordinary decision. Yoshimura, who had actually designed the engine, was from the very beginning a staunch advocate of the four-cycle approach. "Four-stroke engines, " he said, "have distinctive mechanical processes. The (intake) valve closes tight, combustion occurs, the exhaust valve opens, and the exhaust is released. It's a sequence of independent processes, each with a different function, working together to facilitate the engine's entire operation. This is really fascinating, from an engineering standpoint. I believe this mechanism will be the basis of further advancement in engine technology."